Update, February 1: On Saturday, Williston’s We the People team won the Massachusetts State Championship, earning them the right to represent Massachusetts in the We the People National Finals in April at the University of Maryland. They have prepared all trimester, studying the U.S. Constitution, debating in teams, and preparing for surprise questions from the judges. 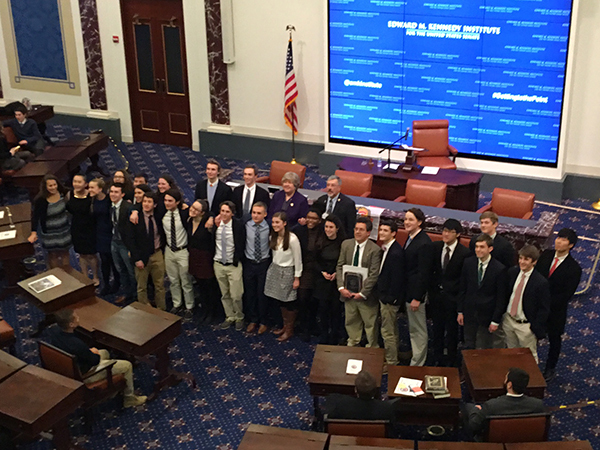 On January 30, students in AP U.S. government classes will once again head to Boston for the Massachusetts State We the People competition to test their knowledge and their debating prowess. Led by faculty advisor Peter Gunn, the We the People program at the Williston Northampton School has been a long and successful one. Williston students have studied the curriculum since 1991 and participated in the state competition since 1998. In 2000 and again in 2013, Williston students went all the way to the national finals in Washington, DC, after winning and placing second in at the state-level, respectively. The Center for Civic Education sponsors the annual program as a way to promote civic understanding and engagement among young people. To that end, the curriculum and competition are built around six broad areas of understanding about the history, philosophy, and development of the U.S. system of government. The competition requires students to first present their prepared answers, then develop, extend, and defend their ideas in response to questions from a panel of judges. As part of their final preparations for the state competitions, the students will spend the next two weeks rehearsing their presentations in front of faculty, parents, and friends. Mr. Gunn said that he hoped such an experience would be both empowering and one that his students remembered fondly. Congrats to the 2016 team! See you in Washington DC !